‘Tis the season for some serious cooking, but thankfully for us novices, help has arrived just in time. I’ve been counting down the days for Cook Beautiful, the long awaited cookbook from blogger extraordinaire Athena Calderone, to arrive and it’s just as stunning as I hoped. If you don’t know Athena, you must explore her site EyeSwoon immediately. An interior designer, entertaining expert and all around savant at living your best life, I’ve long wanted to tuck myself into Athena’s world. After years of long distance admiration, we finally had the pleasure of meeting at my farewell to summer dinner in New York last month. My favorite thing about Athena is the ease she brings to her swoon-worthy style. Cook Beautiful marries her love of amazing recipes with all the tips and tricks you need to bring friends and family around a meal that is as gorgeous as it is delicious. Athena has even curated seasonal playlists for each section of the book! 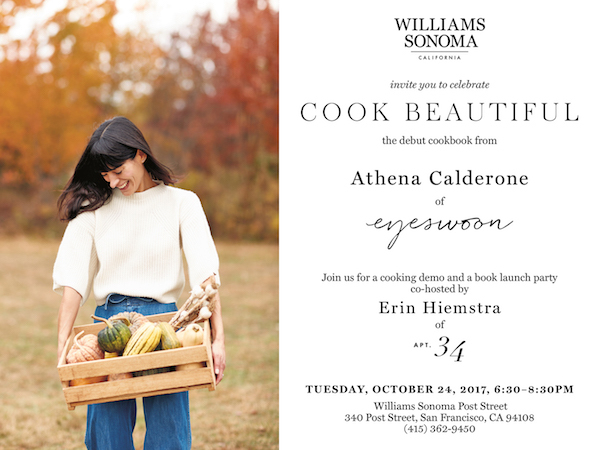 I know I’m going to turn to Cook Beautiful for months to come – that’s why I’m so excited to co-host Athena’s book signing event at Williams-Sonoma next week and you’re invited! There will be a cooking demonstration, delicious bites, good drinks and knowing Athena – a stunning party. I do hope you’ll join us. You can purchase tickets for the event right here. For those of you not in San Francisco next week, I did happen to snag a recipe from Cook Beautiful to whet your appetite. Who can resist a classic pasta dish?! 1. In a large skillet, heat the oil over medium-high heat. Add the sausage and cook, stirring and breaking up the meat, until it’s browned on all sides, 7 to 10 minutes. Remove the sausage with a slotted spoon and transfer it to a plate. 2. Add the garlic to the same skillet and sauté for 2 minutes, until light golden. Add the shallot and cook for 2 minutes more. Add the red pepper flakes, if using, and cook until fragrant, about 30 seconds. Add the fennel and salt and sauté until the fennel has softened, 3 to 5 minutes. Add the stock and cook a few minutes more. 3. Bring a large pot of salted water to a boil over high heat. Add the kale to the boiling water and blanch it for 2 to 3 minutes. Using a slotted spoon, remove the kale and add it to the skillet, along with the sausage. Return the water to a boil and add the pasta. Cook according to package directions until al dente. 4. Drain the pasta into a colander, making sure to reserve 1 cup of the cooking water. Add the pasta to the skillet and cook it with the sausage and kale over low heat for 1 to 2 minutes. If the pasta is dry, moisten it with the reserved pasta water, adding ¼ cup at a time. Check and adjust the seasoning. 5. Finish the pasta with grated cheese and freshly cracked pepper. Serve immediately. I do hope to see you at Williams-Sonoma next week! Recipes excerpted from Cook Beautiful by Athena Calderone, published by ABRAMS c 2017. Photographed by Johnny Miller.